Central Banks over the world have played a crucial role in the economic development of any country. There are various economic tools in the arsenal of a Central Bank that enables to effectively oversee the economic status of a country. A country’s fiscal status, credit environment and inflation scenario are the main driving indicators of economic outlook. Over the past two weeks, World witnessed banks of three major economies viz. US, Europe and England announce their monetary policy and outlook going ahead. US Fed in its FOMC, sounding hawkish, voted unanimously to keep the target range for its benchmark rate at 1.75% to 2%. US Fed has managed to raise its rates from 0% to 2% over the past one and the half years. Bank of England raised UK benchmark rate by 25 bps to 0.75%, highest rate in last 10 years and further rate hikes are expected. While, ECB continues to maintain its interest rates status quo and will continue to make net purchases under the asset purchase program under quantitative easing at the current monthly pace of Euro 30 billion until September 2018 end. It proposed to reduce the purchases to Euro 15 billion looking at the outlook after September, 2018 and then putting an end to the net purchases by the end of December, 2018. By what can be made out from these that the major focus of the banks is to keep a tight check on the economy. Even RBI in its meet on 1st August, 2018 announced a 25 bps hike in repo rate to 6.5% keeping the neutral stance. This was the first time RBI took back-to-back rate hike since October, 2013. 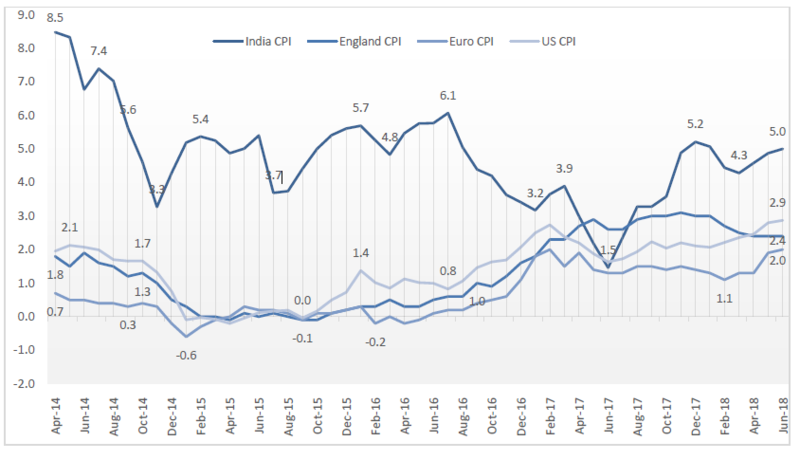 The rate hike came post the rise in CPI to 5% with the outlook for inflation to be at 4.6% in Q2FY19. The Banks continue to tighten the economy post the rising of inflation in their respective economies to the range that used to be back in 2014. Amongst the mentioned above, India being a developing nation needs to take such a stance to keep a check over the capital flows also which is important for stability of the currency. A similar kind of action can be seen from People’s Bank of China post its recent announcement to reduce the Required Reserve Ratio to 20% for the banks to protect its currency from any further depreciation in a US-China Trade war scenario. Japan has maintained its benchmark rate at -0.1% in its latest meet and has tilted towards tightening even in a scenario where its inflation has been forever below 1% over the last four years with the latest reading at 0.8%. The stimulus undertaken by the Central Banks traces itself back to 2008-09 post the 2008 famous financial crises ‘Lehman Brothers’ event. Such tightened monetary policy highlights the fret of these Banks from the possibility of allowing such an event to repeat. The concern to not let the inflation get out of reach and create an economic environment vulnerable to the events that lead to the historic crises has reigned over leading to active management by the Central Banks. However, what these institutions might be failing to consider is the enhanced capability of the Global economy to gulp this high growth rate of development the world is enjoying. Probably there is a lot of power left in the engine driving the Global economy.